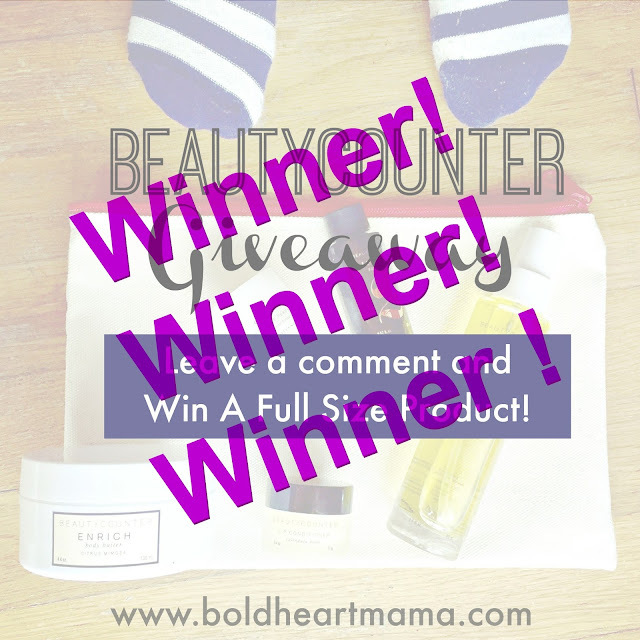 BoldHeartMama: And the Beautycounter Giveaway Winner Is...! And the Beautycounter Giveaway Winner Is...! The lucky winner of the Beautycounter giveaway is Carmen Slayton! Please email me at boldheartmama@gmail.com and I will connect you with Rebecca to complete your order and have it shipped directly to you. I can't wait to hear which product you pick! Thank you to all who entered and shared the giveaway. If would like to learn more about Beautycounter or purchase a gift for yourself or for someone else please message Rebecca Riemer directly at rebecca.p.riemer@gmail.com. She will share samples and help you to find just the right product for you or your kids. Also check out her Beautycounter Facebook page for more information. I really won’t be able to put these products to good use, so I won’t participate. Though, I will suggest some of my friends to.